Pyongyang Trade Fair — Choson Exchange - Visit North Korea & Support Local Entrepreneurs! In mid-October, a fund-manager and workshop volunteer with Choson Exchange visited Pyongyang during the trade fair. These are some impressions. 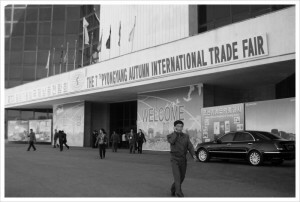 The 7th Autumn International Trade Fair opened in Pyongyang on Monday, October 17th with great fanfare, attendance and exhibitors. 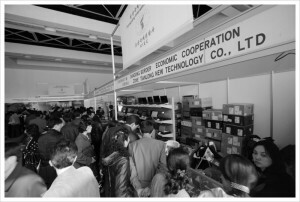 It is by far the biggest trade show to happen in the DPRK since the 90’s, with most major industries represented. 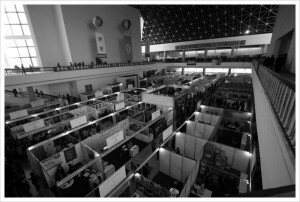 105 exhibition booths filled the giant hall; with businesses from the automotive, construction equipment, machinery, garment, consumer goods (both staples and discretionary items), and a large number of what technically fall under the “pharmaceuticals” banner, but for practical purposes can be best described as “herbal remedies”. A number of foreign embassies also had booths; Germany and India were the two most prominent. There were 25 “trading companies”; 9 based in Rason and 16 from a mix of Hong Kong, Dandong, Taiwan and China. The fair gave local residents with hard currency a chance to pick up foreign-made electronics, house wares and garments (most vendors seemed to favor USD over Euro or RMB). The attendees numbered in the hundreds and were mainly DPRK citizens, though there were a number of foreigners (languages I overheard included Russian, German, Chinese, French and Spanish). I’m fairly certain I was the only American. As I reflect on the attendee mix, it was surprising to see just how much hard currency was in the room. Taking center stage in the exhibition hall was Chinese auto-making giant BYD, whose presence in the DPRK has expanded considerably in the past year. They had their full range of vehicles on display in the exhibition hall as well as representing a disproportionately large share of the noticeable increase in traffic in the capital this year. The MSRP for their mid-sized L3 model is approximately US$12,000 in most markets, however, the car commands roughly a 70% premium in the DPRK due to the higher costs to import foreign goods. While the BYD booth enjoyed a steady stream of people walking through it to get a free keychain, Chinese construction equipment makers Sany and LiuGang and engine manufacturer DCD seemed to have real customers in them. All three had small curtained breakout areas in their booths, which were occupied pretty much the entire time I was there. In unrelated meetings and conversations with members of the Foreign Investment & Economic Cooperation Committee throughout the week, mining projects (originating mainly from China) are on the uptick and the number of heavy trucks on the road has markedly increased over the past two years. When I left the fair around noon, the line waiting to get in had grown from about fifty to several hundred. Overall, my main takeaway from the 9 days I spent in the DPRK compared to my trips over the past two years was that the “activity” in Pyongyang has picked up substantially. The number of building projects that simply didn’t exist six months ago and that now dominate the skyline is staggering, though not surprising given the goals the country has for itself. I counted no fewer than 25 high-rise projects (10+ stories with a handful over 30 stories) that were undergoing “active construction”, though at this point are still concrete shells. In the case of one hotel project, they are actively looking for an outside investor to help them complete the build-out. Time will tell how many of these projects move from their current state to completion.